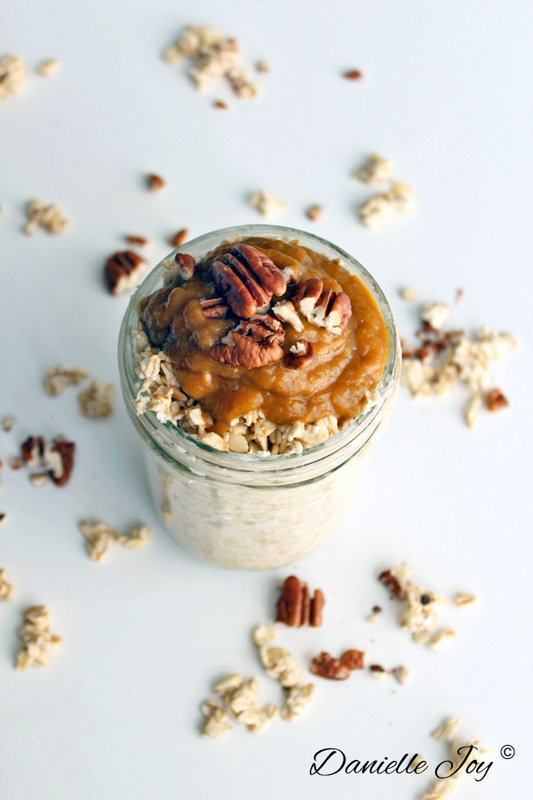 This overnight oats recipe tastes like pumpkin pie. It's topped with a homemade pumpkin butter that takes less than 2 minutes to make! At night, soak the oats in water. In the morning, blend the pumpkin puree, banana, maple syrup, pumpkin spice, and salt in a food processor until smooth. This is your pumpkin butter. Top the oats with pumpkin butter, almond butter, and chopped pecans. Mix well before eating and enjoy every little bite! If you forget to soak the oats at night, you can still make this breakfast in the morning and serve it instantly without soaking.